Incredible views in Big Sky Mountain Village with private hot tub! 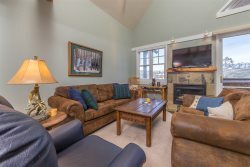 This spacious affordable condo in Skycrest with 2 bedrooms and 2 bathrooms, living area, kitchen, and hot tub is conveniently located in the mountain village at Big Sky. From your condo, take a quick shuttle to the ski lifts, shopping, restaurants, hiking trails, mountain bike trails, lake, and a spa. You can drive 10 minutes to the Big Sky Golf course, Big Sky Town Center events, movie theaters, restaurants, and shopping. - Amazing views of Lone Mountain Peak! - Gas Range, Coffee Maker, Mixer, Toaster, Blender, Roasting Pan, Bakeware, Basic Spices, Starter Starbucks Coffee, Trash Bags, Dish Soap, Dishwasher Soap, Sponge, and Paper Towels. Enjoyed Skycrest, had a great vacation! Spacious and good value. Furnishing dated, but adequate. Hot tub inside windowless cedar room. Real wood burning fireplace. This was a very nice place with a great location. The bus stop to the Big Sky Mountain Village is literally in the same condo building as this unit - you just walk though the garage and the bus is outside waiting for you. Being located on the bottom floor of the unit makes carrying skis and poles even more convenient. Inside, the condo was roomier than we expected, and the master bedroom has a great view. The indoor private hot tub was very nice too. Caroline, the property manager, was very responsive and even offered to mail my partner's Kindle home after he accidentally left it in the bedroom. I have zero complaints, and only nice things to say, about our stay.